Not exactly a typing game, but a useful typing resource for white-board teaching. 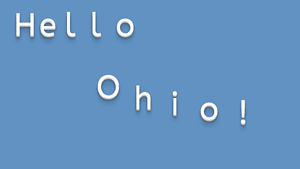 Simply type the letters to add them to the screen (think fridge magnets) then drag them around to spell words. Useful for whole class prefix and suffix examples. As always, let us know how you use the resources, or if you have any suggestions. eg Anyone find bright-coloured (bright-colored!) letters useful? 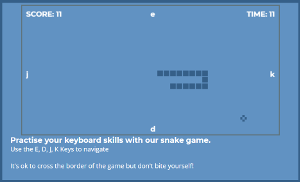 Another retro typing game aimed at practising the home keys to build muscle memory. Race against the computer using the same E, F, J and K keys to navigate. If you hit a previous path, it is all over! Use the space bar to play again. 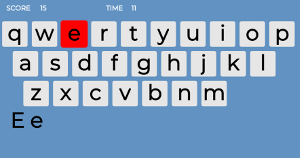 The game can be adapted to use any key combination to vary the keys to practise for each free typing lesson. Contact us if you have any feedback or suggestions. A new typing game aimed at practising the home keys to build muscle memory. 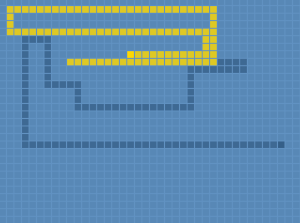 You have 60 seconds to score using the E, F, J and K keys to navigate. The plan is to adapt this game to vary the keys to allow practise for each lesson and set the timer to suit your requirements.Contact us if you have any feedback or suggestions. This first keyboard game is very useful way for young children to get use to the key positions on a standard keyboard. It also helps them learn to recognise upper and lower case letters. This typing game is a quick, easy and fun way to practise typing. 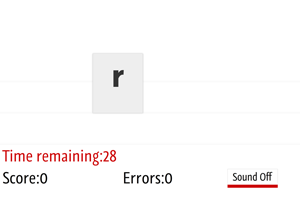 Random letters are displayed and points are scored for each correct letter. Watch out - you will lose a point for pressing the wrong key! We hope you enjoy these games and look forward to receiving feedback from our visitors, so your comments and suggestions are very welcome.